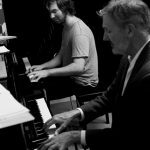 Teaching jazz music in Brisbane, I often come across musicians who are already sinking their teeth into the art of improvisation, yet still don’t know their triads. I was definitely one of these people. One of my teachers caught me out on this during a lesson. He said something along the lines of “oh it’s just a B flat triad second inversion.. no, B flat.. no.. starts on F.. on the 3rd string.. 10th fret… come on man!” It was back to the wood shed for me (which was more like a dank store room underneath an old Queenslander). So I get it, because, well, triads are boring… aren’t they? Since we’ve added 7ths to our triads as well as extensions, alterations and substitutions, triads just seem so plain by comparison. But they aren’t; basic 7 chords, upper structures, groupings of extensions, complex chord structures can all be seen as composites of various triads in all their inversions. Getting a grip on these foundational harmonic building blocks means that, through their appropriate application, you can gain access to a plethora of interesting colours and intervals without getting lost in complexities. Fig 1a. Triads ascending in root position, up the major scale. Fig 1b. Triads ascending 1 3 5 and 5 3 1 alternating. Fig 1c. Triads descending in root position down the major scale. Fig 1d. Triads descending in root position down the major scale connected by lower chromatic or diatonic auxiliary notes. Also try: Triads descending in root position (5 3 1), up the major scale. Triads ascending in root position (1 3 5), down the major scale. And of course, in all keys. In their simplest form, triads are the chord tones that you’re aiming for in your melodies to spell out the chord changes. 7th chords are made up for 2 triads, for example, C major 7th is a C triad from the tonic and an E minor triad from the 3rd. B minor 7 flat 5 (half-diminished) is a B diminished triad from the tonic and a D minor triad from the flat 3rd. So we can treat our 7 chords as sets of 2 triads. An effective way to use these couplings of triads is to try connecting different combinations of them over the same set of chord changes. Fig 2a. F triad over Dmi7 enclosing the B with its lower chromatic auxiliary tone A# to a B diminished triad over G7, chromatically enclosing the 3rd (E) of Cmaj7. Fig 2b. D minor triad diatonically approaching the B diminished triad over G7 which chromatically encloses the 5th (G) of Cmaj7 from above. Fig 2c. Second inversion F triad over Dmi7, chromatically approaching a second inversion G triad which then diatonically encloses the tonic of C6. If we continue to expand this concept of triads beyond the 1 3 5 7 structure of a 7th chord, we start to get into the territory of upper structures, utilizing the extensions. We can see how this is applied very clearly to a Dmi7 chord (Dorian). Fig 3b. Ascending C triad over Dmi7 (highlighting b7 9 11) diatonically approaching a descending F triad over G7 (highlighting 11 9 b7 making it a G7sus4) to chromatically enclose the 3 of Cmaj7. Fig 3c. Descending Emin triad over Dmi7 (highlighting 13 11 9) chromatically enclosing the Amin triad over G7 (highlighting 9 13 11) to chromatically enclose the 5th of Cmaj7. Note the lovely chromatic voice leading from B – Bb – A – Ab – G.
Part II of “Working with Triads” will focus on how we can expand the concepts we’ve worked with on the Major Scale and apply them to other scales such as the diminished and melodic minor.